Making the decision to purchase an AED defibrillator was an easy one. 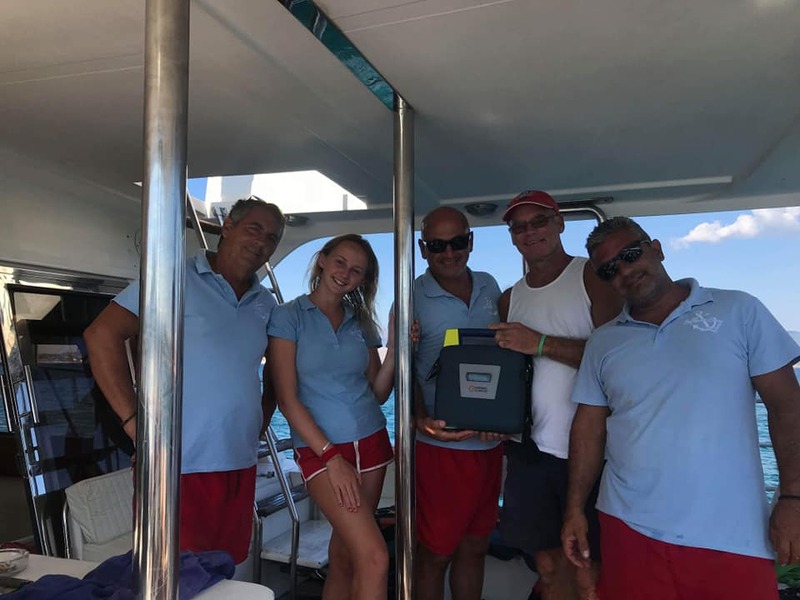 This season there were several cases of people who had unnecessarily died on Kefalonian beaches and unfortunately Kefalonia lost its blue flagship due to not having lifeguards on the beaches as they had had in previous years. As part of our daily cruise trip we visit beaches that are accessible only by boat. 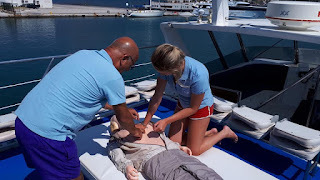 What would we do if a guest on our boat suffered an injury? Of course there is always at least 2 First Aiders on board the Lady O and procedures are followed, however we knew deep down that should someone stop breathing for what ever reason, even if procedures were followed and first aid was initially given, they would have a slim chance of survival if we were on a remote beach. To increase their chances of survival, in the unlikely and unfortunate event that someone should stop breathing due to a heart condition or otherwise, we purchased an AED (defibrillator) as part of our safety equipment. 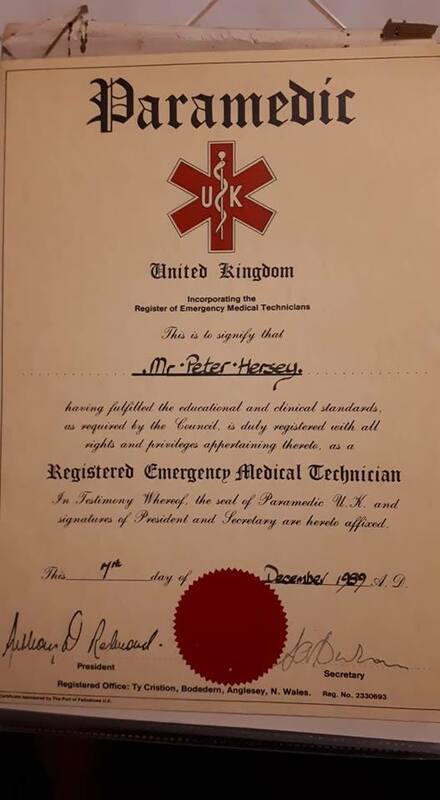 Peter Lee (Also known as Peter Lee Hersey) offered to update the crews first aid training and protocols in order to use the defibrillator in conjunction with resuscitation, if the need arises. We are proud to be one of the first local cruise boats to have a defibrillator but hopefully not for long! Peter Lee presenting the crew with their certificates after they completed the AED Defiblirrator Awareness Course. Little did the crew know at the time they were being trained by Peter what an impressive history he has. He shared a small part of it with me. 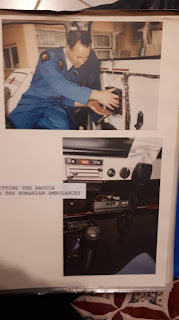 In 1971 he joined the Ambulance service in Kent UK. He qualified as a Paramedic in 1988 and became a Senior External Training Officer for Kent Ambulance NHS Trust in 1995, training advanced resuscitation and defibrillation. 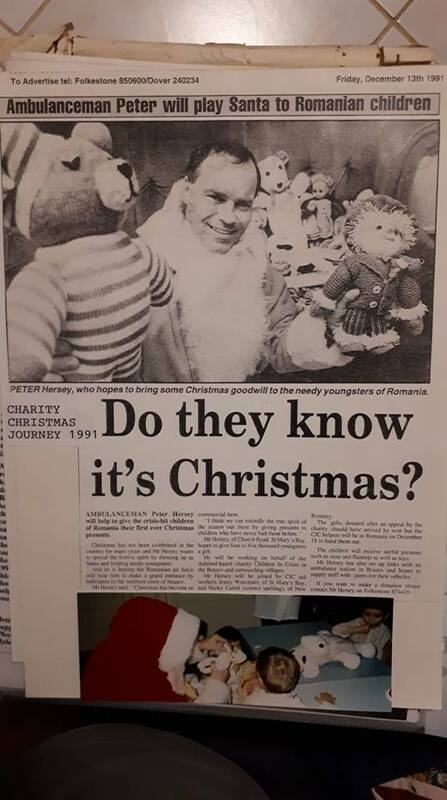 In 1991 Peter raised money to buy several defibrillators whilst in the Ambulance Service by towing a Santa Clause float at Christmas time! 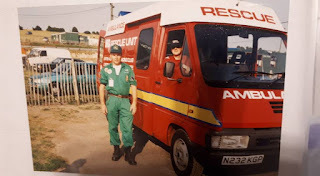 As well as being part of the Ambulance Service, Peter also joined the Retained Fire Brigade and in 1977 rose to leading fireman, breathing apparatus wearer and fire appliance driver. 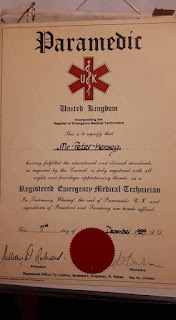 He was available as a fire fighter when not working at the Ambulance Station. 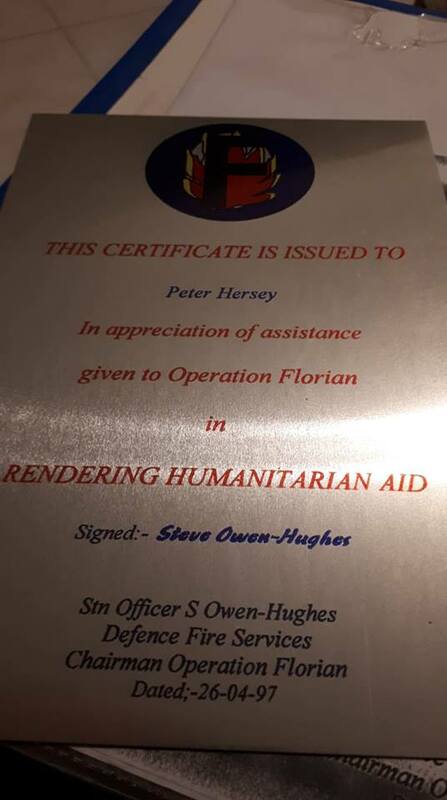 During Peter's time with the Fire Service he was recruited for the International Earthquake Response Team. 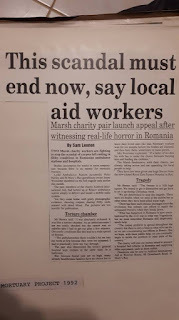 Peter carried out Aid missions for the Romanian Orphanages in the early 1990's after the revolution there. 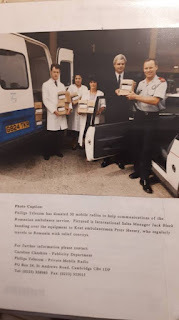 Later in the 1990's he drove an Ambulance to St Petersburg, Russia as a donation for BBC TV That's Life programme with Esther Rantzen. In 1992 Peter installed a whole system of Ambulance 2 Way radios into an Ambulance Station in Romania's second city - Brasov. 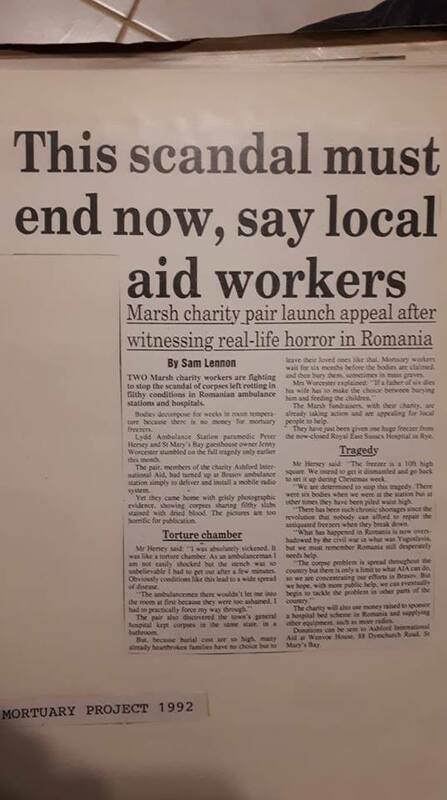 He was given them by a big multi national radio provider after showing them the film of the conditions there. 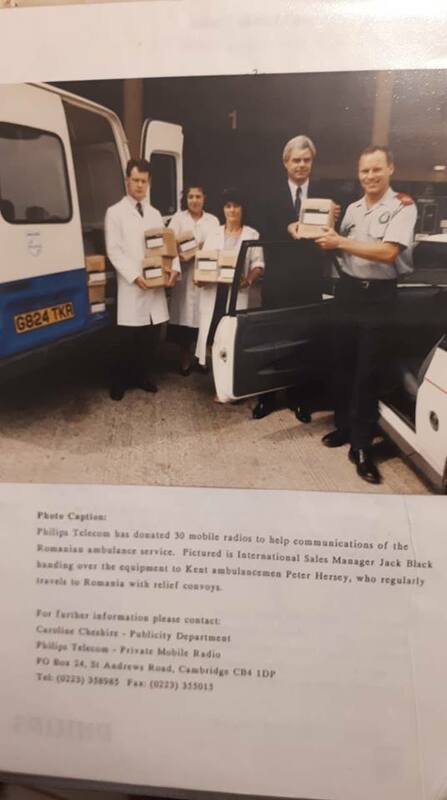 For the FIRST TIME EVER, it was Peter who successfully persuaded the Hasting Health Authority to donate a COMPLETE mortuary unit for him to deliver to Brasov Ambulance Station Romania, to keep the medical-legal bodies in. As if that wasn't impressive enough, since Peter moved to Kefalonia in 2003 he has continued actively helping others, raising money for animals as well as other causes including Firefighting planes together with FLIK (Friends Living In Kefalonia), a registered charity in Kefalonia. 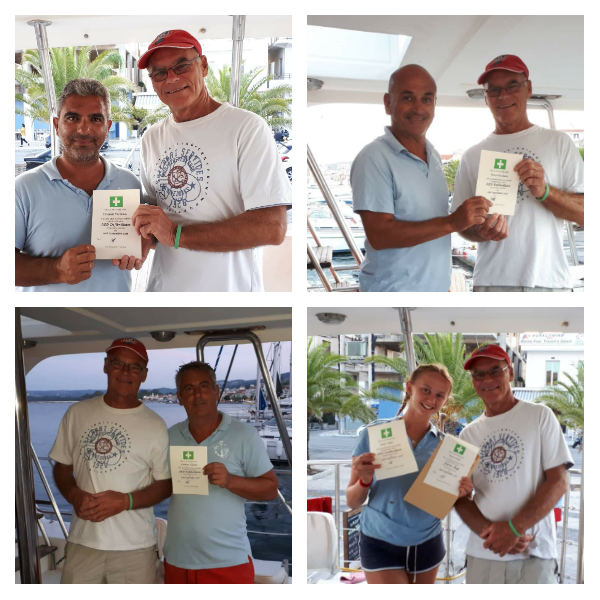 Peter wants to raise more money to place more defibrillators in and around Kefalonia. We have every faith that Peter Lee will accomplish his dream and we are proud to have had an active roll in leading the way. What an asset this man is to Kefalonia. Lucky them! 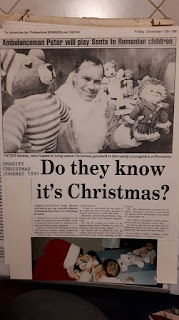 Visit https://www.nhs.uk/conditions/first-aid/cpr/ for guidelines on how to give hands-only CPR to adults, children over 1 years of age and infants under the age of 1 years of age.